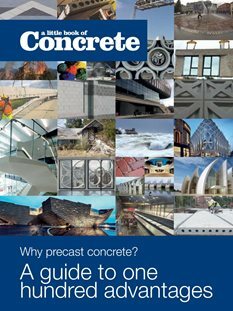 To mark a new chapter at British Precast, we have updated and reprinted The Little Book of Concrete, which was first published in 2007 and is sponsored by CARES. This pocket-sized book outlines what precast concrete can offer the architect, the engineer, the client, the financier and the insurer by summarising one hundred advantages of using the material. Want to claim your free copy of A Little Book Of Concrete (20 max. per member)? Download an order form here.